Finally we can brush off the grill and get started on summertime grilling. Here is a magnificent grilled chicken recipe using roasted garlic, tangy lemon and intoxicatingly aromatic za’atar. We are a bit old fashioned in our grilling method. We use a charcoal style barbecue and I always buy mesquite lump charcoal. The mesquite really enhances the flavor of your grilled vegetables and meat. Although a bit more time consuming with ash clean up and building a fire; it is certainly worth it when you taste a hint of mesquite in your grilled food. 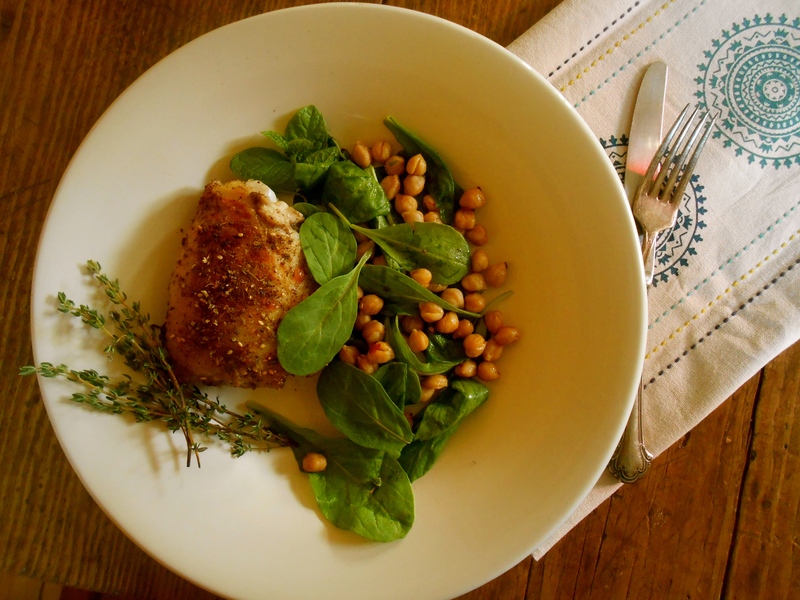 Deliciously served with a baby arugula and warm chickpea salad. There are two ways to go with this. Admittedly I don’t have much forethought when it comes to cooking. I think about food and cooking all the time, but I don’t plan ahead and take the step of something so simple as marinading the meat for 24 hours. The original recipe suggests marinading, but I wanted to cook it now, not tomorrow. I went ahead and prepared the marinade and allowed it to steep for approximately 45 minutes while the chicken was warming to room temperature. The flavors were fresh and vibrant and the heat from the serrano pepper was just enough to let you know it was present. 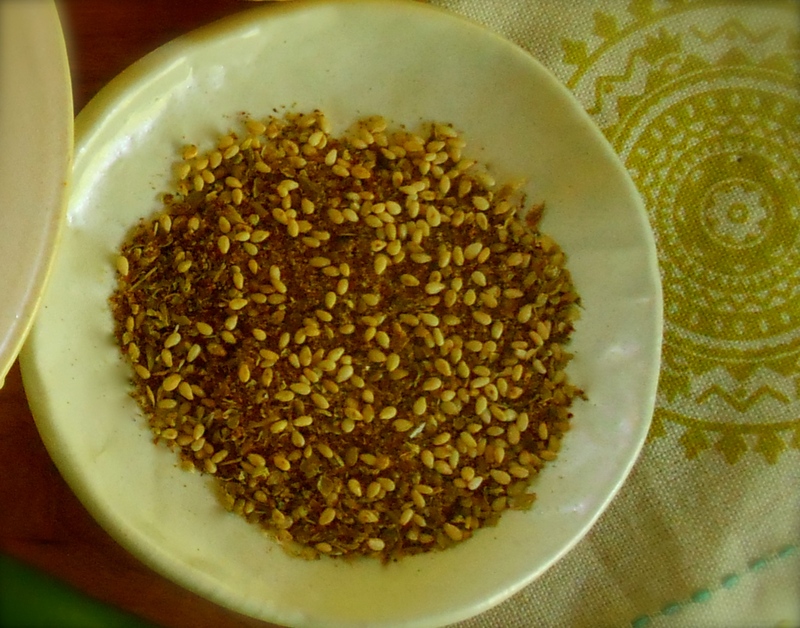 The za’atar is every bit intoxicating in flavor as it is in fragrance. Preheat oven to 400°F. Put garlic on a large sheet of foil. Drizzle with 1 tablespoon oil and wrap tightly with foil. Roast until tender and golden brown, 45-50 minutes. Let cool. Place chicken in a glass baking dish large enough to hold chicken. Sprinkle 2 1/2 tablespoons za’atar over chicken. Squeeze roasted garlic cloves out of skins and into a small bowl; mash into a paste with the back of a fork. Add 4 tablespoons oil, lemon zest and juice, rosemary and serrano; whisk to blend. Pour over chicken; turn to coat. Cover; chill overnight – or not…allow to steep for one hour while chicken is warming to room temperature. Meanwhile, build a fire in a charcoal grill, or heat a gas grill to medium-high. Brush grill rack with remaining 1 tablespoon oil. Grill chicken, turning occasionally, until skin is crisp and browned and an instant-read thermometer inserted into the deepest part of thigh without touching bone reads 160°, about 35 minutes. Transfer chicken to a cutting board, sprinkle with remaining 1 1/2 tablespoon za’atar, and let rest 10 minutes. Heat 2 Tbsp. oil in a medium skillet over medium-high heat; cook chickpeas, thyme, and red pepper flakes, stirring occasionally, just until warmed through, about 5 minutes. Transfer to a large bowl. Toss arugula, lemon zest, and lemon juice into chickpeas. Serve drizzled with more oil and sprinkled with sea salt. Oh yum, Seana! I’m totally with you. We got rid of our propane grill years ago, and replaced it with a big charcoal grill. I don’t think I’ll ever go back to propane… yes, it’s convenient, but there is nothing like food prepared over charcoal! This looks so delish… and I know that I’ve mentioned before that Katie loves chickpeas…she’ll love this. I’ll be sharing this with her. Thank you. :) Charcoal grill w/o the lighter fluid!! Right! you are always such an inspiration in the morning. this looks yummy. This is so gorgeous. Each photo is more beautiful than the next and you’re using such beautiful fresh ingredients. I love charcoal grilling and the mesquite flavor really does add to it. I like that you use thighs here instead of breasts. They too add flavor. And roasted garlic is possibly my favorite thing in the world, with lemon and thyme. I can only imagine what a wonderful smell this had while cooking. I like that you add a little heat to everything too. A meal fit for a king or just close loved ones. Gosh, what a lovely comment Amanda! I feel the same way about roasted garlic. We kept slipping them out and eating them before mashing them into the marinade. :) I have to admit when I started preparing this meal it seemed a bit daunting. I really wasn’t in the mood for a long drawn out kitchen episode, after all it was Monday night! It occurred to me once I had the chicken on the grill it really wasn’t challenging at all! Went together with ease! And the opened bottle of cool crisp rose’ helped too…. Well said! I kept thinking about how sensory it is…but couldn’t put it to words…writer’s block. Delicious meal and I love your recipe for Za’taar. I also use charcoal, there is nothing like the flavor of grilling over hot coals or wood and yes Mesquite is the best!! Don’t you love the smell of burning applewood or mesquite! There are two different streets near my house where these fabulous restaurants burn applewood in a wood fried oven and I love driving past there. The za’atar recipe called for fresh oregano, I used a greek dried oregano and it was very aromatic and fine. I thought about dry roasting the sesame seeds before adding them. Next time. Seana, this all looks wonderful. I’ve always used charcoal too! Your recipe for za’atar sounds very aromatic indeed and I think I may have to have those chickpeas tonight! Thank you Selma. Nice to hear from you today. The warm chickpea salad is wonderful, I think I will be serving it often, and you might too after you try it. :) Enjoy the day! A whole post full of lovely!!! Oh yum. Seconding Elaine’s thoughts above! And this phrase is why I’ve been so drawn to you and your posts: “I think about food and cooking all the time, but I don’t plan ahead…” Yes, yes, and yes. Me too times a thousand. But we have so much fun with it we don’t care and we always (ok, “usually” for me) figure it out in the end. You are hilarious Liz! Lolololl! I’m cracking up here! :) The tart is out of the oven and awaiting your arrival. Wish we lived close to each other! I can tell we’d have lots of fun. My favorite seasoning. Zatar is delicious sprinkled on toasted pita bread chips. This looks like a wonderful meal. Yes! I’ll make some for sure. Now it’s my new favorite spice combination! Is your combination similar to this one? What a perfect meal! We haven’t used our grill for this summer…looks like we should! So where’s your restaurant? I love the presentation and flavor combinations. I never see the point in marinading overnight, unless you’re tenderizing tougher cuts of beef. That definitely works wonders. With chicken I would’ve done the same as you. And I bet no one would be able to tell the difference. As for the za’atar! At last I’ve found out how to cook with it. Like so many things it just needs oil and a bit of frying. Still haven’t tasted it grilled – and with the weather we’re having that’s not going to happen any time soon. Mesquite? Will Google that one. Oh this looks so beautful! You’ve inspired me to haul out the charcoal bbq (which we never use). Love that you ‘heavily adapted’ the recipe and also that you think about food and cooking all the time. This I understand! Hi Lindy. Sometimes I find myself thinking about dinner way too early in the day, like even before breakfast! We really love using the charcoal grill. The craziest time was Christmas dinner a few years ago. Not only was it dark outside, but freezing too and I insisted on lighting the coals and grilling steaks! Hi Seana, we love charcoal, the other is easier but the flavor is charcoal for us. Love zaatar, one of my favorites. Yes, agree with you. We have been using za’atar quite a bit lately. We sprinkled it on salmon the other day too. Wonderful! I could sit and smell it all day! Yum! I’m a charcoal chick too, though in winter the cast iron grill pan on the stove does a fair job, you still get a nice charry flavour. An Israeli girl I worked with introduced me to za’atar years ago, it’s been a regular in my kitchen since, used like dukkah as a herb and sesame dip. IMO long marinating time can take away the beautiful flavour of chicken. I’d have made the same decision that you made. Just as I’m getting out the soup pot… Not to worry, I’m sure the grill will still get its fair share of the action! Nice work. I love soup year round..but then our weather stay fairly mild in the summer over in these parts. This looks so incredibly delicious Seana! I know what I’ll be putting on the grill just as soon as it starts to warm up again… and what a beautiful salad to serve alongside! All these lovely flavours…Yummy! It must be so delicious!! Thank you Serena. You are a vegetarian, right? You are so kind to comment on a chicken post! Because really, it’s not so much about the chicken…it’s the flavor. I have really been enjoying your posts. I need to make your lovely cake made with Manitoba flour! We just opened our summer cottage in Maine a couple of weeks ago and that is where I do all my grilling. I can’t wait to try this recipe…if not this weekend then the next as it sounds great. I’m the same way — can never seem to remember to marinate meat overnight. Lovely recipe, thanks for sharing!! I’m so happy that grilling season is finally here. The chicken looks fantastic! Me too! Sometimes I love to toss five or six vegetables on the grill and call it good; one of my favorite summertime dinners. No meat required. The chicken is beautiful! I probably over marinate!!! I finally bought sumac, and now I know what to do with it – thanks!!! Thank you so much Mimi. I have to say I really enjoyed reading about your trip to My French Heaven. Sounds like you really had a lovely time. I appreciate you comment today! :) Doesn’t sumac smell great! Must admit to using gas. Faster, less work and cheaper too but the result is not the same. Love zaatar and would not have thought to use that quantity but am very intrigued! I love zaatar & you made your own! Yeahh! I am happy to see that! What a beautiful fragrant & divine combined dinner! Yummm! 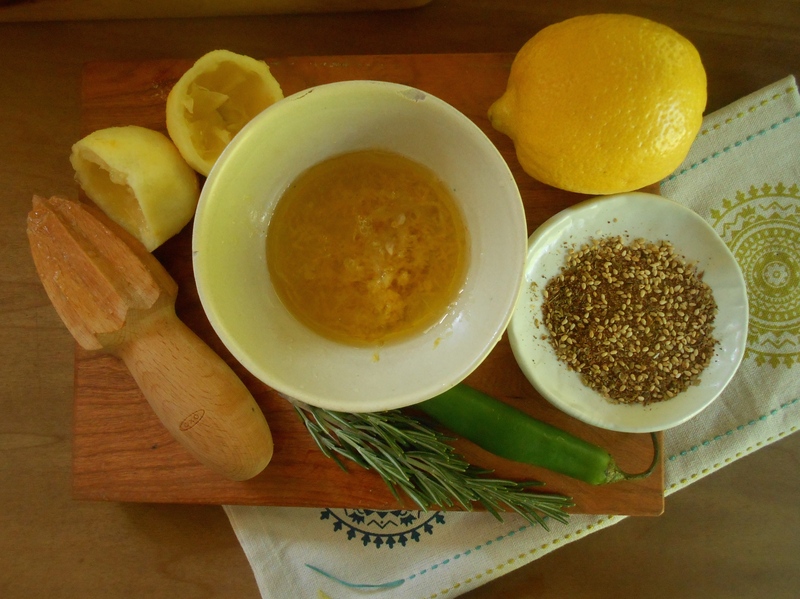 Looks so tasty – been looking for a simple za’atar recipe – must ry this. I miss grilling with a charcoal grill. Both meats and veggies taste so much better that way. I have a gas one now but it’s just not the same. Anyhow, your chicken looks perfectly cooked and delicious, Seana. I’ve never had za’atar but it sounds so good! Thanks for sharing this, I will move in a new house with a big balcony, we already planning to buy a grill…now I know the choice we have to do! Your chicken looks really yummy, and this is even because of your great talent! I learned two words today: za’atar and mesquite. I don’t have a bbq grill but I will remember to use mesquite charcoal when the time comes. I would love to be in your kitchen and taste the wonderful exotic dishes you’ve been making. Ahhh what a perfect, simple, yet interesting dinner. I am one of za’atar’s biggest fans, and we often have nearly this exact dinner but with salmon instead of chicken. I love that you’ve paired it with a warm chickpea salad, too! I really want to try that salad actually! As amazing as hummus is, there’s something about a cold, round, solid chickpea that is just not that appealing (unless it’s been seasoned/roasted till crunchy). I often have extra cooked barely-seasoned chickpeas in the fridge and I often toss them, plain, onto salads… I guess the trick is to season & warm them up first, and make them the starring ingredient! Yes! Exactly. Well put about the chickpeas. We have had this same dinner using salmon too! It’s fantastic and I keep finding myself sprinkle crazy with za’atar; eggs, potatoes, burgers…the list goes on. I loved this salad and now that I think about it I think I’ll make it tonight. :) Great to hear from you Allison! You are currently reading grilled chicken with za’atar at COTTAGE GROVE HOUSE.